What do you see as key themes which would benefit from greater research in Bangladesh? In South Asia everyone knows India is the up-and-coming global giant, but people have started watching Bangladesh as an emerging economy and important player in the neighbourhood. Our country is strategically located, in between two trillion-dollar economies that have populations of over a billion, and at the gateway to South East Asia which is another important bloc in terms of growth and development. Bangladesh wants to take advantage of its strategic location. That has been well understood by the leadership under the present government led by PM Sheikh Hasina. In the 2008 elections she launched a vision dedicated to the youth: “if you vote for me, I will build a digital Bangladesh”, i.e. a knowledge-based, technology-based middle income country. This was the first time in the history of Bangladesh where a political leader undertook to deliver middle income status to a country which has in the past been described as a basket case. She laid out an ambitious plan and it’s a challenge for the government to implement it. The indicators are favourable: we were successful in realising many of the MDGs and we are poised to take on the implementation of the SDGs. We are facing up to the challenges of climate change, disaster management, terrorism and other political issues, and we are working towards an inclusive Bangladesh. The question is how is the leadership attaining its ambition to achieve middle income status? It is a huge transformation to go from a traditional rural economy to a modern knowledge-based economy. There is a rapidly growing middle class so hopes and aspirations are changing very fast. In this transformational process, is Bangladesh bringing in the correct perspectives? Can the leadership sustain it? Are all issues being approached holistically? These are all areas where research could be immensely beneficial. I also served in Geneva as the Bangladesh Permanent Representative which covered the WTO. Now the multilateral trading system hopes to benefit everybody and Least Developed Countries (LDCs) like Bangladesh attach a lot of importance to the mechanism in the hope of reaping benefits. For example, the WTO created the opportunity for duty free quota-free market access – we call it preferential treatment for LDCs. However, at the moment the LDCs are not getting much benefit, because there are some global giants, the movers and shakers, who have proved not to be fully committed to implementing the decisions of the WTO. If academic institutions were able to do research into the implementation of decisions in the multilateral trading system, it could significantly strengthen the position of LDCs like Bangladesh. How do you think research supported by institutions in the UK can constructively influence policy in Bangladesh? If you take a referendum on “where do Bangladesh scholars and students want to study?” I’m sure that 95% or more would like to come to the UK. We have a common historical legacy. But is not only the education – our leadership and even other political parties aspire to a British Westminster style democracy, with an emphasis on human rights and inclusiveness. There is wonderful social discipline in Britain which is valuable for sustaining growth and development. Compared to other LDCs, Bangladesh has made remarkable progress, and without any proven natural resources. It is the only country which has developed a huge base of private entrepreneurial families. Furthermore, these families are not only concentrated in cities, which makes for more balanced growth. Ordinary downtrodden underprivileged people are covered by social security programmes, microfinance and other supporting interventions by the government. How is this transformation is happening? How is the leadership delivering? What role is civil society playing in this process? If British institutions can offer research and understanding into present context, and highlight the future issues Bangladesh should think about to ensure sustainability their insights would be very welcome. How have UK-Bangladesh relations have evolved in recent years, and how do you envision them developing from here? Bangladesh and the UK are traditionally excellent friends. We believe the UK is a proven partner for Bangladesh and we truly value the relationship. There are ties across education, culture, even democratic processes, and the UK is our largest market in Europe after Germany. Most importantly, since Bangladesh’s independence, Britain has been a solid development partner, funding our development projects, and supporting Bangladeshi self-reliance. Bangladesh is now self-sufficient in food production, it has done well on the MDGs and created a huge, very visible transformation. 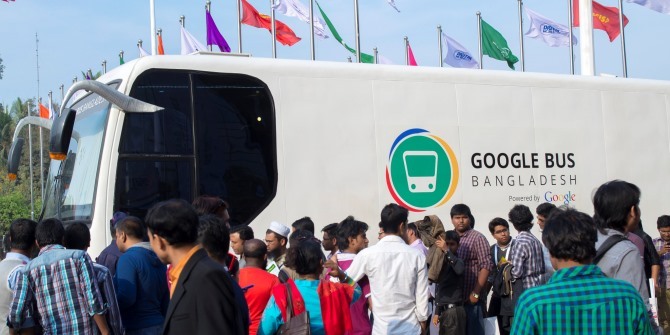 But now, Bangladesh needs to mature: with globalisation and overall interconnectivity, we need to incorporate modern technology and raise our standards. The UK can offer the skills and knowledge that Bangladesh could benefit from at this time. There is also room for fruitful partnerships in exports and the service sector more broadly. The service sector in Bangladesh produces 54% of GDP and the UK is possibly the best country in the world – and definitely in Europe – to provide support on this. I am urging the British authorities to treat the service sector as one of the priority areas for collaboration. Bangladesh attaches a lot of importance to improving investment relations between the two countries. Unfortunately there has not been much visible change in recent years although the trade partnership remains mutually beneficial. However, in May, the former Prime Minister David Cameron appointed a trade envoy for Bangladesh. This is recognition of Bangladesh’s potential, and demonstrates the British leadership understand that it is an important market in South Asia. So I think this will define the immediate future of UK-Bangladesh relations. You’re an economist by training – what is your take on the ongoing debate about growth versus development as routes to reducing poverty in Bangladesh? Bangladesh aspires to create jobs through growth. If you look at the last 9-10 years, we have had 6-7% growth and this year we achieved more than 7%. But we must ask, is Bangladesh only after growth-led employment opportunities? We have put emphasis on small and medium size industries, such as the textiles/garment industries, ship building and other manufacturing industries which are all very labour intensive. But relying on growth alone can create challenges around inclusiveness, poverty-reduction and so on. Bangladesh is possibly one of the very few countries that have created a balance between the rural and urban economies. Our entrepreneurial class is not necessarily concentrated only in the cities. The prime minister is very keen to establish 100 extra economic zones, which will be centres of economic development and revenue generation that are scattered all over the country. We are creating balanced growth internally, while also welcoming foreign investors and changing the quality of life of the people. If you really want development it must be inclusive and sustainable. We therefore aspire equally to incorporate modern technology, because without that we cannot raise standards. If we want a knowledge-based, technology-based, innovation-based society in the near future we need to have the export-led growth, but we must be serious about the technological standards. The Bangladesh government has a five year plan, and in the planning process we created balance between export-led/labour intensive growth and technology-based growth. Our leadership, economists and planners are fully aware of the need to make Bangladesh a role model of balanced growth. As the father of the nation, Bangabandhu Sheikh Mujibur Rahman stressed, the aim is to create “Bangladesh for everybody”. Md. Abdul Hannan is a career diplomat, who obtained his MSS degree in Economics from Chittagong University and his MA in Diplomacy from the University of Lancaster, UK. Before his appointment as High Commissioner to the UK, Mr. Hannan served as Ambassador to Switzerland and Permanent Representative to the UN Offices in Geneva and Vienna, and Ambassador in Oman. He previously served in Bangladesh Missions in Karachi, Ottawa, Kolkata and Moscow in various capacities. Sonali Campion is Editor of South Asia @ LSE. She holds a BA (Hons) in History from the University of Oxford and completed her MSc in Comparative Politics at LSE.